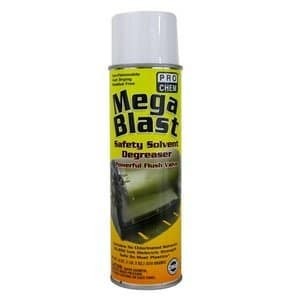 MEGA BLAST | Pro Chem, Inc.
MEGA BLAST is a high-performance, fast evaporating, nonflammable replacement for chlorinated and chlorifluorinated solvents. It is an excellent electrical contact cleaner and degreaser that dries quickly and residue free. With the powerful blast valve, it quickly removes grease grime, wax and oil from motors, relays, switches, generators and control panels. Spray parts thoroughly, holding actuator close to surface. Use extension tube for hard-to-reach areas. Use only in well-ventilated areas. For heavily encrusted areas, brush, then rinse off with a second application. *Safe on most plastic. Do not use on modern plastics; LEXAN®, ABS, NORYL, STYRENE and POLYSTYRENE PLASTICS. Pretesting on small inconspicuous area is suggested on questionable plastic surfaces. Note: Energized equipment use only. Not to be used for motorized vehicle maintenance or their parts.